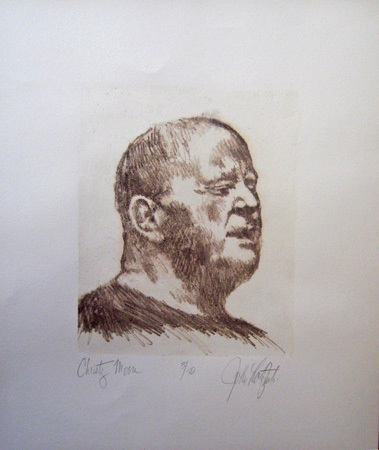 Growing up in the 1950’s in San Diego, California, painter John David Ratajkowski remembers “being able to draw anything I could see.” Fascinated as a boy by all variety of materials, Ratajkowski was early on adept at painting, sculpture, ceramics, printmaking, lithography. He recalls that the key attraction for him in every case was the compelling desire “to make”—whatever the media. 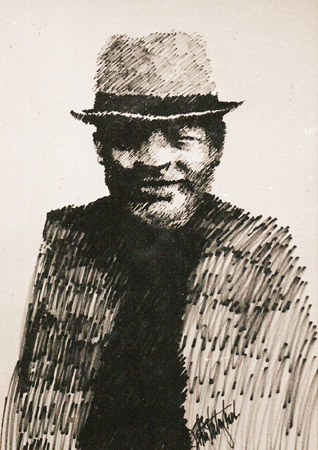 His exceptional drawing ability found expression in a series of pen and ink drawing of Black American blues musicians published as illustrations in a seminal work on American blues. Early on, though, Ratajkowski knew his “true love” was painting. Funded by a grant from the National Endowment for the Arts, an exhibition of remarkable large black and white portraits of Alzheimer’s patients testifies to Ratajkowski’s capacity to render the figure realistically, even as his interpretation of his subjects demonstrates the unique power of his vision. Ratajkowski’s abstract work took him to Ireland for a two-year sabbatical to work at non-figurative landscape; this work resulted in two major exhibitions in Dublin. He was invited later to be resident artist at “Dom Polonia”, a national arts council in Poland, and then to Bulgaria to exhibit in that country’s Triennial. During this time Ratajkowski traveled through Eastern Europe photographing and sketching Gypsy communities and producing a series of painted collages of Gypsy life. The exhibition of this series was sponsored by the Lipinsky Institute for Judaic Studies and presented through a grant from the California Council for the Humanities. Ratajkowski’s experiments in abstract work have powerfully impacted his portraiture. A series of portraits of Jewish literary figures depicted in film combined Ratajkowski’s abstract painting techniques with his long-time work in the portrait. Key to Ratajkowski’s work is travel without which he explains he would become numb to his surroundings. The need to absorb the influences of different places paired with his fascination with material and technique manifests itself in all aspects of Ratajkowski’s life: for the last three decades he has restored two old houses, one in the pueblo of Sant Joan, Mallorca, and the other in Bantry, County Cork, Ireland. Exhibited in the US and internationally, Ratajkowski’s work appears in private and corporate collections; he is represented by the Blue Leaf Gallery in Dublin, Ireland, and the CJ Gallery in San Diego, California. Today Ratajkowski, with his wife and daughter, divides his time between their home in Del Mar, California, and the two farmhouses in Ireland and Mallorca.